What are Kush Queen Bath Bombs? The Kush Queen bath bombs were designed for users to experience 100% relaxation. Hand-made with the finest ingredients, Kush Queen bath bombs include essential oils and lab tested cannabis. The Kush Queens Bath Bombs come in four distinct categories, each specifically designed to help with a certain health or physical condition. They also include varying ratios of CBD, THC, or pure isolates of each compound. The bath bombs are available in these four options: Relax, Relieve, Sleep, and Awaken. 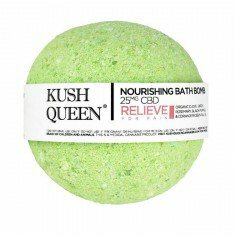 Kush Queen Relieve Bath Bombs were particularly designed for people who need to alleviate pain. Relieve bath bombs are perfect use after a workout session, or even just chilling out after a long shift. Relieve bath bombs are perfect way to lay back and feel refreshed! Fill in your bath with hot water and drop in the bath bomb. Immerse yourself in luxury and feel the therapeutic effects of pure CBD and other potent herbs. The Kush Queen Relieve bombs are of medical grade. The cannabis oil essentials used in making this product are extracted using a supercritical CO2 method. All ingredients are 100 percent organic and lab tested to ensure the safety of its consumption. All Kush Queen bath bombs contain no artificial dyes or preservatives. It contains food coloring which is non-transferrable and totally safe for absorption.